Nagra reputation in digital conversion is not new and dates from the Nagra D, in the early 90s. The Nagra D was the first 24/96 kHz recorder available on the market and the company designed their own discrete A/D and D/A converters for it. 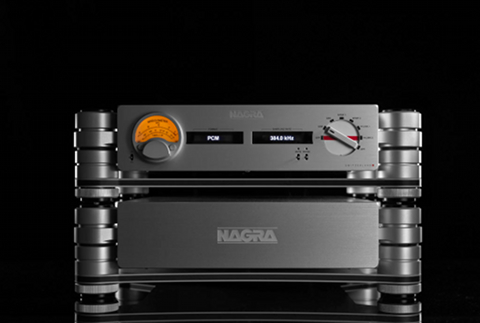 In 2013, Nagra introduced the HD DAC, a statement D/A converter that is highly regarded and received numerous awards. The introduction of the Nagra HD Preamp in 2018 and the evolution of music files resolution toward DSD 256, encouraged the company to design a new reference D/A converter. Like the HD Preamp, the HD DAC X is a two-chassis design and the converter shares most of its power supply and mechanical vibration control solutions. The power supply is based around a massive bank of super capacitors that has the advantage of silent operation, like battery, but are more stable given that they do not discharge over time. Each electronic stage uses individual power supplies with its dedicated low-noise regulator. The HD DAC X uses no less than 37 different power supplies and the digital section itself has 16 of them. Inside the audio unit, the digital section is a completely new design, including a new proprietary USB input. The converter can play signals up to DSD 256 (or DSD 4x). The digital section is designed to be upgradeable, whereas software or hardware, to cope with the evolution of formats and sources. The converter features an extensive selection of digital inputs, including two Nagra-optical inputs for future Nagra high resolution sources. The analog section adopts a dual-mono topology and each channel has its inter-stage transformer and tube. The transformers are of a new design and are hand-wound at Nagra facility in Switzerland. First production units are being delivered in January 2019. The suggested retail list price in the US market is $64,500.